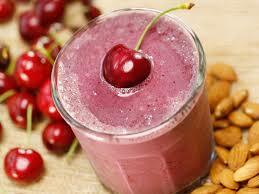 A thick, frosty drink of cherry juice concentrate, frozen cherries, blueberries, lowfat milk, lowfat yogurt and vanilla, topped with a mix of dried cherries and chopped nuts. Blend all ingredients in blender until smooth. Pour into two chilled glasses. Garnish with the almonds and chopped cherries. Serve immediately. Sit back and imagine you’re surrounded by cherry blossom. And some more text underneath. Repeat text and image columns as often as necessary.